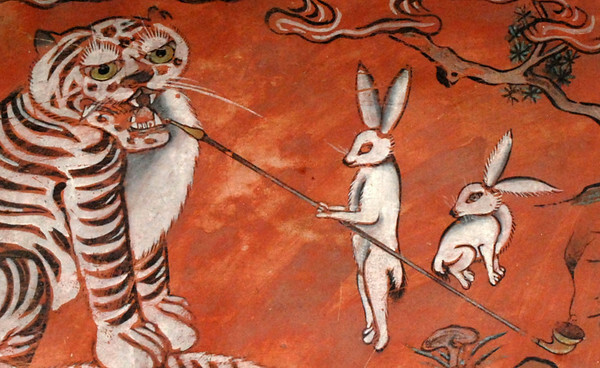 Why did the rabbit give the tiger a pipe? 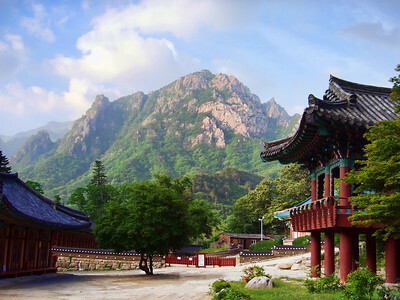 Today, on the second new moon after winter solstice, is Korean New Year, or Lunar New Year. With the new moon also begins the Year of the Rabbit. We’d gone into the courtyard to have a space for our baby away from the traffic and crowds for a few minutes. Just as we were about to leave, a monk came down from one of the buildings and motioned us to follow him around to the side of the main hall. He wanted to show us the painting and see what we thought. 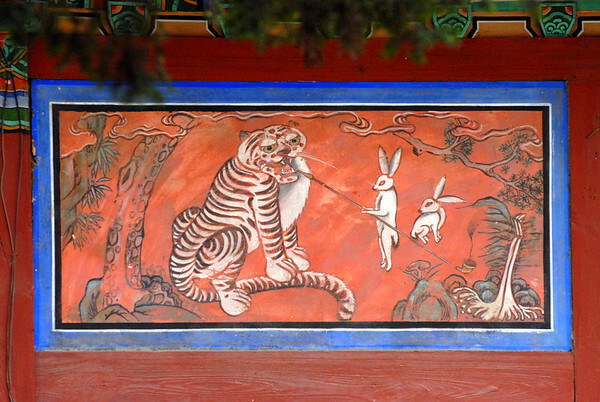 Usually, the paintings on a temple wall are depictions of the Buddha’s life, or Zen stories, such as the ten ox herding paintings, but here was a painting of two rabbits offering a pipe to a tiger. The only thing that came to mind was, “To save their own skin!” but lacking confidence in my thoughts, especially when it comes to Zen, I shook my head. Out of pride, I sort of wished I’d spoken my mind, but once that wore off, I thought about the answer a little more. Initially, it seems basically selfish of the rabbit. He’s not genuinely concerned for the tiger’s wellbeing, if he were, he’d offer him something like a cup of tea, or perhaps his own flesh. I suppose back when tigers smoked pipes, they may not have been aware that it wasn’t very healthy, though. He’s only concerned about the tiger’s contentedness for his and his friend’s sake. As I thought about it more, it reminded me of my own path. I didn’t become interested in the Buddha’s teachings for anyone’s sake but my own. I was (probably still am) self-centered, depressed, and hid behind a mask of cheerfulness not to let anyone see the real me. Eventually, I read in a book that I should shift my attention outwards, to be concerned for others. Grudgingly, I tried, because it was supposed to bring me happiness also, of course. Eventually, it started working, not because I was any happier, but because I’d genuinely started developing more concern for those around me. So, maybe the rabbits , acting out of self-preservation, do have some concern for the tiger’s joy. And knowing rabbits, they probably have a den full of babies depending on their safe return, in which case, they’d but much more needed there than in the tiger’s belly! Happy Korean New Year! Saehae Bok Mani Badeusaeyo! Have a nice Year of the Rabbit!